Hard to believe that our 2017 peonies season is almost done for ordering. 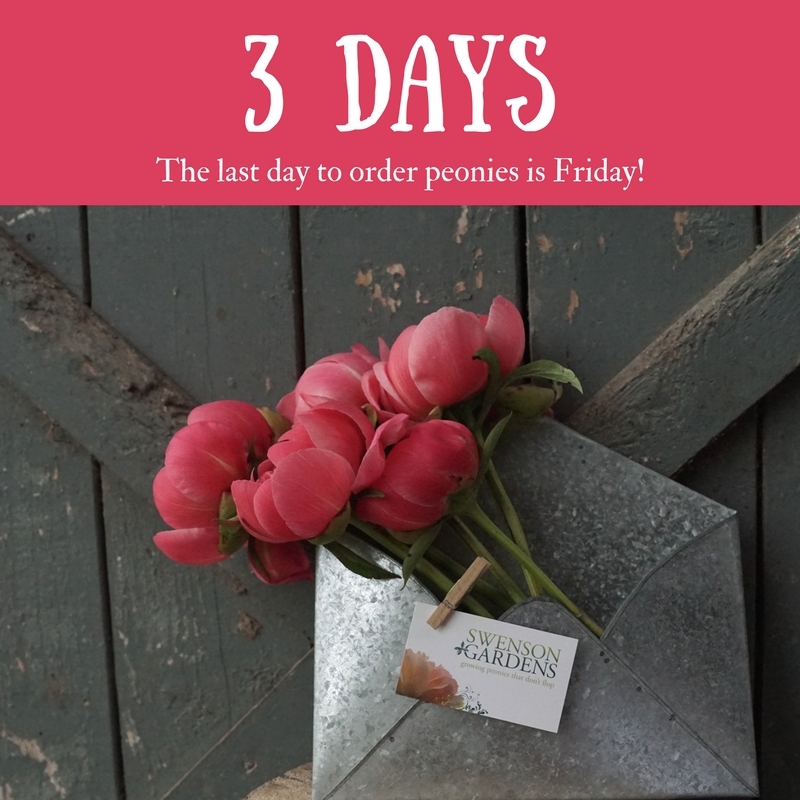 Friday, September 22, 2017, will be the last day to order for all growing zones. Thank you for letting us grow your new peonies! 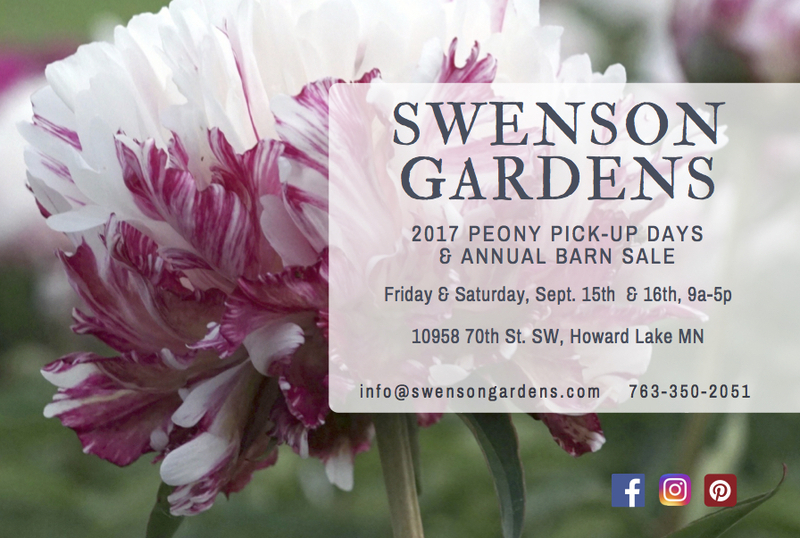 Gentle reminder that those customers who are picking up your peonies, we are all ready for you on 9/15 & 9/16 from 9 am to 5 PM. We are NOT open on Sunday, 9/17 so please be here on the 15th or 16th. When to plant your new bare-root peonies? As soon as possible! Do not leave your new orders in your vehicle all day or outside for days before planting. We take extra steps to make sure your roots are fresh so when they arrive at their new home, plant them within a day or two. IF you cannot do that, place them in a cool, dark spot for a few days and then get them in the ground where they belong. 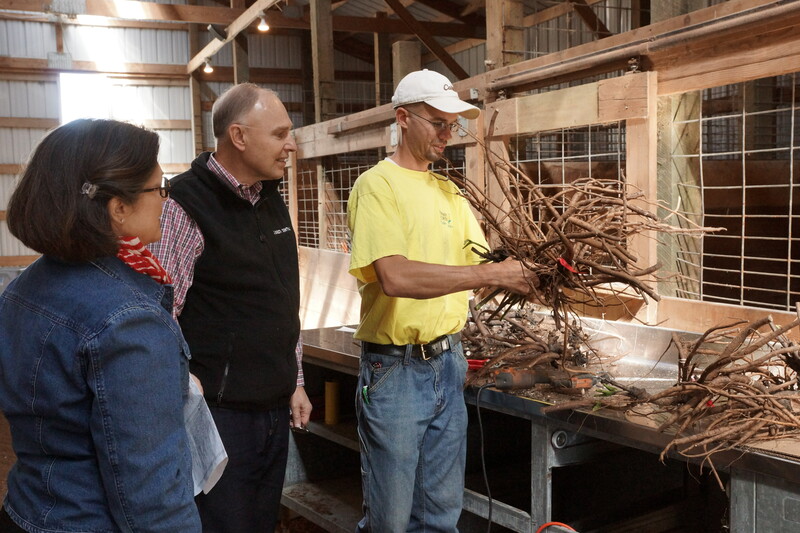 We do not guaranty our plants, but we do guaranty that all our roots have received the utmost in care and nurturing while on our farm and we try to give you as many tips to help your planting and care! When you drive up our driveway, go past our house and you will see signs for parking in our old riding arena. (Very sad that it has now been converted into a parking lot and wild bird feeding area but that’s another story since our daughter does not ride anymore.) After parking, come to our large white canopy for information and give the greeters your name so they can retrieve your order. Ok for some that have been asking about our peony barn sale, here you go. 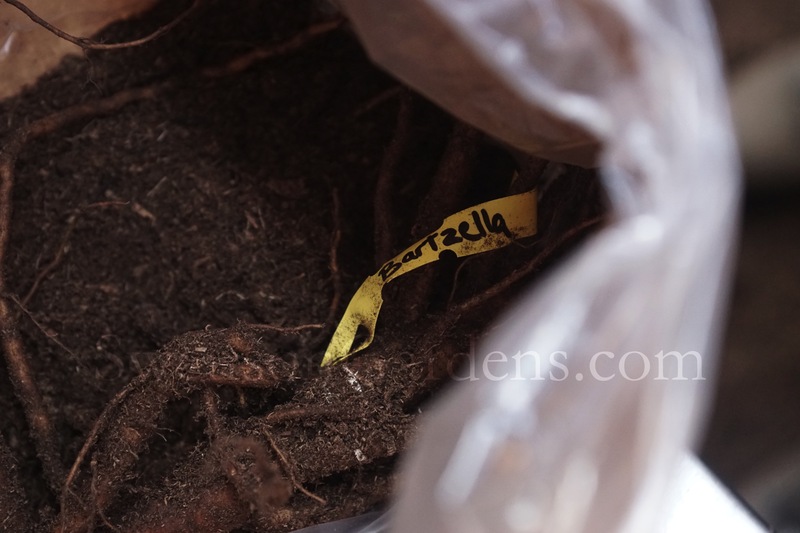 After our first dig we have extra retail and wholesale bare-root peonies available for sale. Those of you who are picking up your order, we also give you an additional 10% off on new peonies purchased that day. The retail roots are at their normal price so if you missed out on getting that special peony, now is the time to purchase it or many! Then we have a huge area where roots that did not make our retail grade are offered at reduced pricing. ONLY CHECKS OR CASH ARE ACCEPTED! We cannot hold roots for you and all roots are first come first served. For you peony lovers, this is heaven on earth! We will be open rain or shine so head north, south, east and west to your peonies destination spot! Yes our peony fertilizer will again be available during our peony pickup days and barn sale! Though our son is in college and this young man featured in this post is now serving our country, a couple of our weed crew members will be selling this for their future college plans. 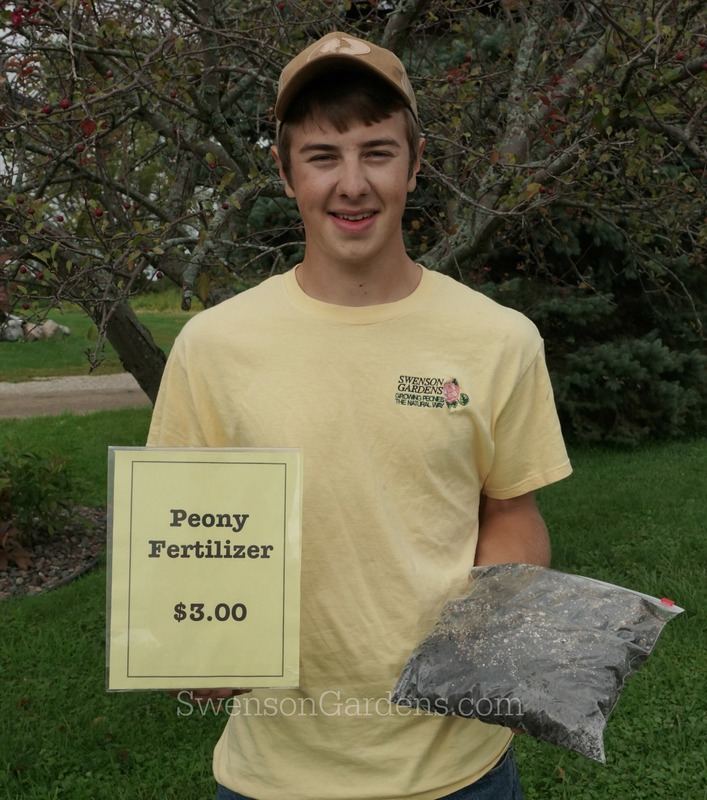 One bag per peony plant is all you need for a one-time application. This is the same chemical free mixture that we apply in our new peony fields. Your peonies will be set for decades. During our peony pickup and peony barn sale on 9/15 and 9/16, Danny will be demonstrating, ‘how to dig, transplant and divide peonies‘ at 10 am, noon and 2 PM each day. Also, if you would like to bring a pre-washed peony plant, we will help you divide it so you can share those peonies with family and friends during those times! FIRST SHIP PEONIES ARE ON THE WAY! Been a whirlwind of activity the past couple of weeks getting all the peonies ready to ship out. We are using two different carriers this year so please note these changes. For all of our customers in Illinois, Iowa, Minnesota, Nebraska, North Dakota, South Dakota and Wisconsin, your orders will arrive by Spee-Dee Delivery. They were picked up this afternoon and should arrive at your location within 1-3 business days. For all other states in USDA Zones 2-5, your orders will arrive via USPS Priority Mail this week or early next week. For those of you in the first ship that requested a later delivery, you may still receive an auto reply email from our GoDaddy online store and USPS. Please disregard as we can’t stop those emails from going out knowing that your orders are very comfortable in our coolers. So dear gardening friends, the last of the first ship peonies for USDA zones 2-5 are packed safely in their box en-route to their new home. Perhaps that was your intersectional hybrid peony ‘Bartzella’ waiting patiently with the other peonies for their journey to your garden!